Well, that didn't take long. With the plethora of small-batch Cronut knock-offs popping up in bakeries all over the world, it was only a matter of time before the big boys came out to play. 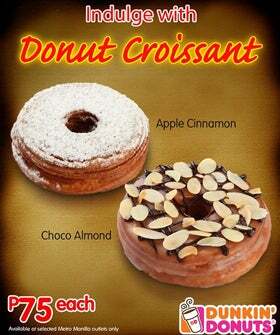 Just a few weeks ago, Dunkin' Donuts launched their Donut Croissant, a flakey, fried confection which looks suspiciously familiar to the original artisanal baked good that took the world by storm less than two months ago. But there's a catch. If you want to try the factory-made Cronut, you'd better live in South Korea or the Philippines.